The drone’s main structure and arms are made of Windform GT. Drone manufacturer Parrot designed the Parrot Bebop 2, a lightweight and compact drone that offers easy-to-use piloting using d collected by seven sensors. Bebop 2 integrates a front facing camera which is digitally stabilized on three axes. The first Bebop 2 structure was built on injected parts made with polyamide based glass reinforced composite material. Parrot next moved to SLS technology in collaboration with CRP Technology in order to improve the structure’s performance without developing long lead time and high cost injection tooling. CRP produces composite materials for additive manufacturing, including Windform XT 2.0, Windform LX 2.0, Windform GT, Windform SP. Each material has mechanical features that make them the suitable materials for several applications. Parrot said that that natural frequencies of parts manufactured with Windform GT, a polyamide based glass microfiber reinforced composite material with a dark black color, were similar to injected parts with polyamide based glass reinforced composite material. 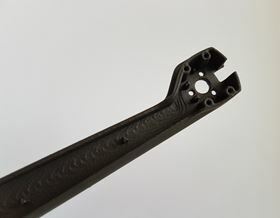 Using 3D printed Windform GT material also made it possible to make small batches of production with acceptable mechanical properties to provide functional products to the team. This story is reprinted from material from CRP, with editorial changes made by Materials Today. The views expressed in this article do not necessarily represent those of Elsevier. Renishaw has made use of metal 3D printing to produce components to help improve the performance of the Land Rover BAR boat.